Boys ivory / cream 4 piece waistcoat suit for baby boys, toddler or older boys. The perfect boys suit for many occasions including a christening or wedding. Waistcoat: Ivory / cream waistcoat with a diamond self-pattern on front with silver flecks, fully lined, double pockets, 3 centre buttons, adjustable strap/buckle on back for a perfect fit. Trousers: Cream trousers, double pockets, belt hoops, elasticated on rear. Shirt: Long sleeved ivory / cream shirt, full-length centre buttons, buttoned cuffs, down-collar, perfect compliment to the waistcoat. Cravat: Ivory / cream cravat with matching diamond self-pattern with silver flecks and an actual diamante in the centre, velcro fastening at the back, complimenting the suit perfectly. 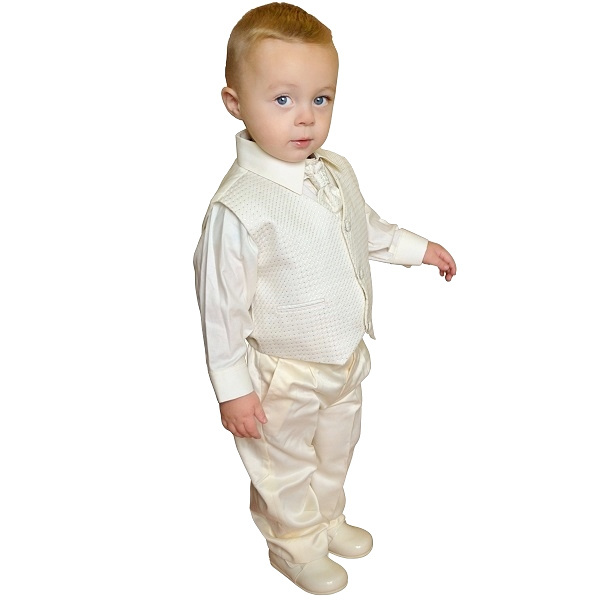 This boys suit in ivory / cream will make him look like the perfect handsome gentleman at his christening or a wedding. We bought this for our son's dedication at our church. It came quickly and without any wrinkles, so we were able to put it straight on our son on the big day. He was the best dressed baby on the stage. Excellent item for the price, thank you!